21 Prohibited grounds of discrimination – (g) ethnic or national origins, which includes nationality or citizenship e.g. The form that the Chief Executive insisted that Singaporeans send to the Singapore CPF Board will adversely affect only Singapore Citizens, because all other nationalities have been returned their CPF SAVINGS. Mr John Key has collected his CPF Savings (along with thousands of NZ Citizens and other nationalities) so why is my CPF Savings a PENSION that is deductible from NZ Super? 66 Victimisation – (1) It shall be unlawful for any person to treat or threaten to treat any other peson less favourably than he or she would treat other persons in the same or substantially similar circumstances. There are dozens of websites and blogs floating around on the www about New Zealand’s discrimination against Singapore nationals, an unlawful act under New Zealand’s own Human Rights Act 1993. What price does one place on REPUTATION? As an analogy, a Singapore Citizen (Roy Ngerng, a true story) is pummeled to the ground by the Singapore Prime Minister when he asked for the return of his life-time CPF Savings. As he is lying on the pavement, with broken legs and broken hands, the Chief Executive of the NZ Ministry of Social Development (MSD) comes along and takes the coins left in the victim’s wallet (deductible NZ Pension). The NZ PM with his wallet full of his CPF Savings he had collected tax-free from the Singapore CPF Board passes by the poor victim, looks down at him lying on the ground, turns on his heels and walks away. The MSD, in deducting 100% of CPF Savings is actually taxing a Singapore Citizen 100% as the amount is deducted from his entitlement – while all other nationalities, including New Zealand citizens who had worked in Singapore received their full REFUNDS from the Singapore CPF Board. How is money from the same CPF account be different for Singaporeans (deductible NZ Pension) while all others, including Mr John Key, are non-taxable savings? The MSD, in fully participating in Singapore’s DISCRIMINATION, is also GUILTY of DISCRIMINATION, whether DIRECTLY or INDIRECTLY. The MSD in paying the full NZ Pension to New Zealand, Malaysian, Australian, English, Indian and Indonesian citizens who had worked in Singapore and had been REFUNDED their CPF Savings in FULL before they reached 55 years of age is again DISCRIMINATORY. 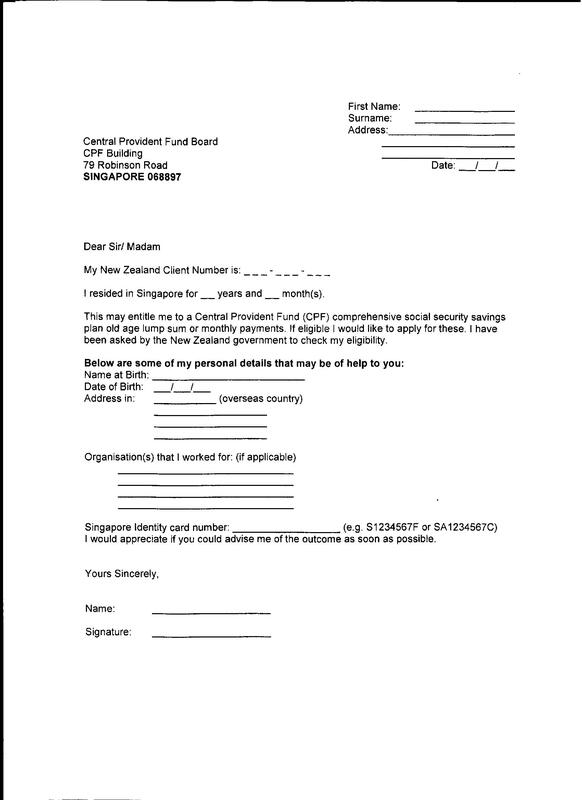 The MSD in paying the full NZ Pension to former Singapore Citizens who had given up their Singapore Citizenship and NOT to Singapore nationals is again DISCRIMINATORY. Instead, the exaggerated interpretation that the CPF is a Pension, Benefit or Periodic Allowance similar to that of New Zealand, under Section 70 of the Social Security Act, is a blatant LIE. Unless the English language is different in NZ, one’s savings (like Kiwisaver) cannot be deemed a pension, benefit, periodic allowance or payment. When one with-draw’s money monthly from one’s savings account (to pay the inflated Rates, electricity and water bills), it would be totally skewed to call those withdrawals payments from the bank. PEOPLE in HIGH POSITIONS of POWER should have even HIGHER MORAL STANDARDS.